Education for Justice is proud to announce Literacy as our biennial theme for the 2015 and 2016 academic years. Literacy is traditionally defined as having the ability to read, write, speak and listen. According to the U.S. Department of Education’s National Center for Education Statistics (2003), 12% of adults in Lackawanna, Luzerne, Wayne and Wyoming counties were illiterate and 13% of adults nationwide lacked basic prose literacy skills. According to the Literacy Project Foundation, 14% of the United States population cannot currently read above the fifth-grade level, and only a third of fourth-graders read at the level of proficient. Traditional illiteracy remains a serious challenge in Northeastern Pennsylvania, the United States, and the world. However, literacy in the twenty-first century goes beyond its traditional definition to include several additional literacies required to contribute to the greater good as engaged and compassionate professionals and citizens. Such literacies require citizens to be able to navigate vast sources of digital information, to understand how the global impacts the local and vice versa, and to take care of one’s health and financial situation as well as those of others. 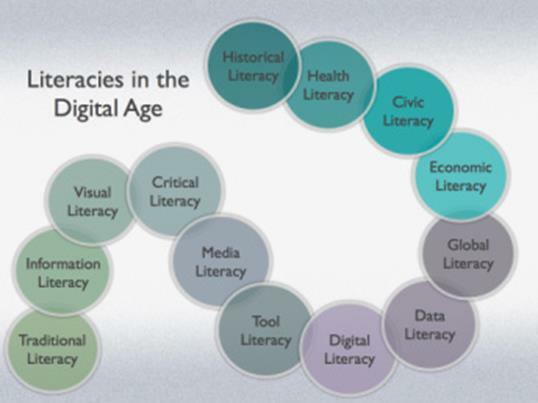 Librarian Kathy Schrock’s image below presents many of the literacies necessary in our twenty-first century landscape. Others could include sexual literacy, spiritual literacy, and environmental literacy. We invite you to add others to our campus list as we explore literacy in reference to justice over the next two years. Our goal for our biennial theme of literacy is to question what would be a just basic literacy in each area of literacies in our digital age. We also must question what basic literacy in each area is necessary for justice to prevail. We would like to assist faculty in exploring with students questions such as, “What would basic data literacy look like in a just world? Who should receive it or provide it? How might it be developed through more just means?” or “What basic environmental literacy is necessary in order for us to live justly?” Our hope is that we will explore the questions of justice and literacy from both the individual and global perspectives. It is important we do so not only to the growth and development of our country, but also to the perseverance of citizens around the world. We are writing to ask for your help in making the programming around our theme a success. Encourage your students to attend Education for Justice-sponsored events. Incorporate our biennial theme of "Literacy" into your spring courses. Do you have your students write essays, create videos or posters, draw, paint, or take photos? Why not use our biennial theme as the focus of their creative pursuits? Apply for an Education for Justice grant. We have funding to support new initiatives or the enhancement of existing programs that encourage reflection on the meaning of justice, make us aware of injustice in our society and throughout the world, and introduce us to various methods of analysis, so that we may be able to respond. Contact Dr. Mike Allison (michael.allison@scranton.edu) or the Education for Justice office (justice-education@scranton.edu) if you would like a copy of the grant application or if you would like to incorporate the Education for Justice theme into your course(s) but are unsure how to get started.